One of the definitions of a lemming is a person who unthinkingly joins a mass movement, especially a headlong rush to destruction. When it comes to your healthcare marketing, don’t be a lemming. Because you’ll literally be rushing head first into irrelevance and destruction. In general, great products and services (healthcare services being no exception) are table stakes in today’s marketing environment. Unless you’re a destination healthcare brand like Memorial-Sloan Kettering, Cleveland Clinic or Mayo Clinic who own a compelling and category defining brand idea, spending your precious healthcare marketing dollars to communicate and shine the spotlight on organization, hospital or service line features and tangible benefits (a la technology, quality and awards) does little to help you break the ties. There’s enough research out there today to support the fact that the majority of advertising isn’t noticed or remembered at all. And social media in healthcare, much of which is seemingly authored from the standpoint of “enough about you (the consumer) let me tell you about me (the organization)” is simply ignored or actively blocked. Similarly, the voice of too much healthcare content marketing is often indistinguishable across organizations. Is healthcare marketing today too daunting a job? Depends how wide a lens you have into the world around you (actually not “you” – but your perspective customers). Because to have any chance of making a dent in their lives, you need to begin with a holistic view of who they are – beyond a prospective healthcare patient – and where they’re going. Here’s another important fact to take note of if you’re developing healthcare marketing strategy. While the pressure to compete and expand market share is at an all-time high for hospitals and health systems – we’re also in a time where brands no longer influence people. People do. Which means your customers are the medium. And they’re now in control. They are not interested in brands trying to sell their way in. They’re interested in brands who create content, conversations and experiences that they want to get involved in. Which means you need your customers to actively participate in your healthcare marketing. The payoff is that those consumers will turn into your most valuable marketers. Today, brand success is predicated on the extent to which consumers are active participants in a brand’s programs. This is what makes a brand truly relevant to consumers’ lives. Multiple cross-category examples of brands that are winning the relevance war through new levels of consumer participation and engagement include: ZocDoc, Warby Parker, Citi, Red Bull, MasterCard, JetBlue, CVS, Cleveland Clinic, et al. Important to note, scale isn’t required to be a leading participation brand. Any brand can join the club. 1. Command and control doesn’t work. 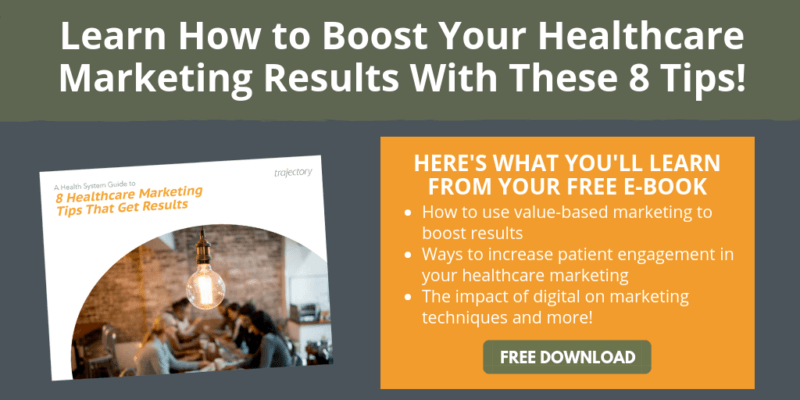 Rather, you’re approach to your healthcare marketing needs to be that of “guide and share.” Pulling people in by actively participating in their lives. Who will then actively evangelize on your behalf. Consider the analogy of two gears engaging one another to advance something forward. In today’s fluid healthcare environment, business success will require a strategic gear shift to respond to today’s new realities. Efforts might include helping patients stay well through community health initiatives, enabling easier and more convenient access through mobile apps, virtual care and retail care, thinking more broadly about the entirety of a patient journey experience (like ZocDoc), building direct relationships with employers, etc. 2. Leading with purpose. Your customer sees beyond your healthcare services. They’re yearning to align with beliefs and values that mirror their own. A bigger purpose – one that’s communicated, demonstrated and genuine to your healthcare brand –is their starting point for participation. Purpose also provides something to talk about to your consumers; it offers the opportunity to build a community around shared values and gives them a reason to talk about your services. At the same time, purpose aligns and sets a clear direction for all functional teams. A strong brand with a compelling purpose provides meaning and direction for employees, contributing to overall employee satisfaction. 3. Powered by community. For brands to garner participation, they need places – either physical or digital – for their audiences to engage and connect. Consider the physical Citi Bikes locations. MasterCard’s digital Priceless hubs. Both are examples of building brands with people, not just for them. Is it possible to build these kinds of communities in healthcare? Certainly. It starts with developing a more comprehensive understanding of the needs of the patients and communities you serve – and where investments in more consumer-centric approaches will drive results. At the same time, it requires looking beyond those you most directly compete with – to experiential competitors (who might replace you) and perceptual competitors (who are changing customer expectations across categories). So here’s the formula. Practice participation. Support with these three pillars. Get your market to do your marketing. Reap the reward of outperforming without outspending. Interested in building participation and enhancing brand and business performance? Reach out to have a conversation.